Recreational cannabis sales via licensed stores ballooned 88% in Colorado last year to hit nearly $600 million, according to calculations based on data from the state’s revenue department. But an equally compelling story is tied to wholesale recreational marijuana sales, which soared 163% in 2015 to hit $234 million. The wholesale numbers indicate a thriving market for companies that cultivate marijuana for retailers (as opposed to rec shops that only grow for their own needs). 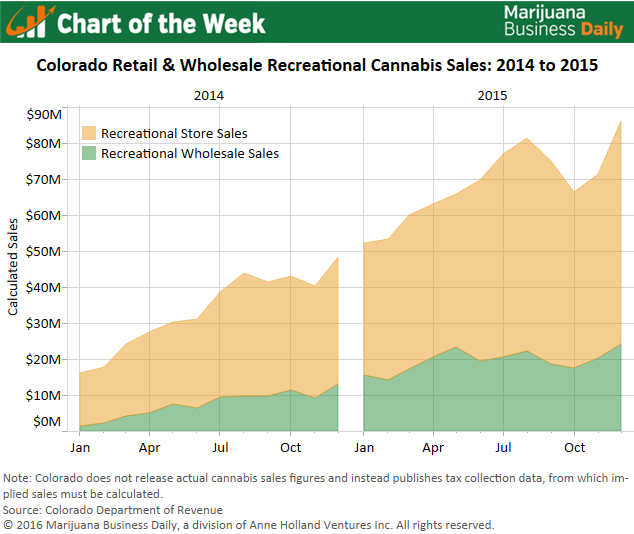 The spike is somewhat expected: During the first nine months of recreational sales in 2014, stores were required to cultivate at least 70% of their own cannabis, limiting the potential size of the recreational wholesale market. The requirement was removed in October of that year, so wholesale transactions naturally spiked. However, no one was really sure how big the wholesale market would be. The latest figures from the state indicate that demand for wholesale cannabis is strong. Robust wholesale markets are a necessity in a market like Colorado where retail outlets are abundant, consumer demand is high and competition is tight. It simply would not be cost effective for every one of the state’s 426 retail stores to cultivate all or even most of the cannabis they sell, nor is there enough commercial space available thanks to extensive local bans on these businesses. Though this was a unique circumstance that will result in less impressive year-over-year growth figures for recreational wholesale sales going forward, it’s an important part of the story and is one of the clearest examples of the tremendous potential in a market that allows wholesale cannabis sales vs. those that don’t.